Tag Archive | "National Bike Month"
With the welcome return of warm weather, May is recognized as National Bike Month. Bike to Work Week is May 15-19, with Friday, May 19, designated as Bike to Work Day. 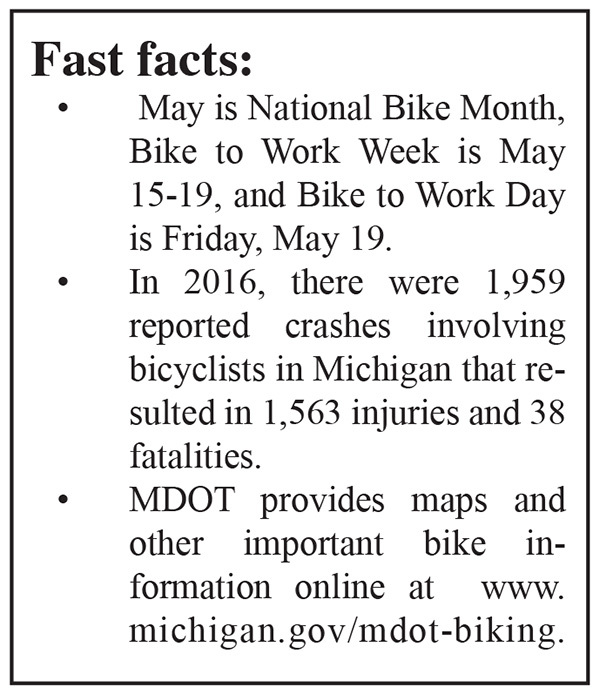 The Michigan Department of Transportation (MDOT) encourages other transportation agencies and the public to help raise bicycling safety awareness and promote the safety message: Give ‘em Space, Make it Safe, Please Share the Road. In 2016, there were 1,959 reported crashes involving bicyclists in Michigan that resulted in 1,563 injuries and 38 fatalities. According to the Michigan State Police Office of Highway Safety Planning (OHSP), that number of fatalities is up 15 percent from 2015 (33). The number of fatal crashes involving bicyclists remains disproportionately high compared to other roadway users or crash types. Motorists are reminded that bicyclists are permitted to ride on most roadways in the state. In fact, Michigan has a growing number of bike lanes and thousands of miles of shared-use pathways that bicyclists use and enjoy. Many communities are building bicycle-friendly infrastructure, and drivers must remain attentive when driving and take extra care when approaching bicyclists as the warmer spring months lure people outdoors. Bicyclists are reminded that, as legal roadway users, they are required to obey all traffic laws, signs and signals. A person operating a bicycle upon a highway or street at less than the existing speed of traffic shall ride as close as practicable to the right-hand curb or edge of the roadway. 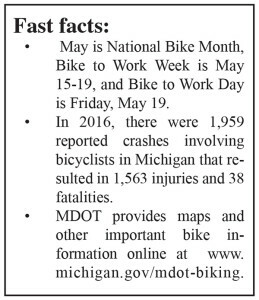 For maps and other important bicycling information, including “What Every Michigan Driver Should Know About Bike Lanes,” go to: www.michigan.gov/mdot-biking.